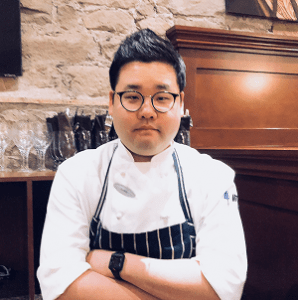 Simon Park, Chef de Partie has been cooking for 10 years. He attended the University of Nevada and during his tenure there, he attended culinary school in Las Vegas, while working in the Luxour Hotel and Pacific Island Club in Saipan. After he graduated he opened and operated a restaurant in Saskatchewan, Canada before moving to Calgary in 2015. He worked at the Delta Kananaskis Lodge and OEB Co as Sous chef. His passion comes from cooking for family and friends. Simon’s future goal in the culinary world would be to open his own locally sourced restarant.